Some writings about Poland drive me up the wall. Poland is NOT all about the Pope. Poland is NOT all vigorously Catholic, nor is it unanimously jubilant about the free market. Not all Polish women are blondes and we're not as fond of cavalry charges against tanks as the rumour would have us - in fact, there are hardly any horses left on Polish fields. Compared to all the rubbish written about Poland and the Poles in the foreign media, A Country in the Moon actually looks good. Moran has lived in Poland for many years and took time to get properly acquainted with the country, its history, customs and character. He explores Polish literature, music, architecture, cinema, politics, traditions, sounding really sympathetic and appreciative most of the time. He did not make a single spelling mistake in Polish place names and phrases - an accomplishment that none other foreign writer about Poland (that I know of) managed to achieve. Overall - a friendly and well research account of how Poland once was. Oh yes. There's not much of contemporary Poland in A Country in the Moon, and what's there doesn't really match what I remember. The book is full of dusty anecdotes about Polish nobility from years ago, of glorious past of sparkling carriages and romantic poets. Sure, that's part of our heritage, the picture it paints is mightily enchanting and deserves better publicity, but does it represent the country as it is now? 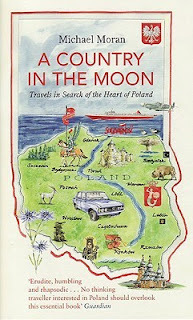 Still, Moran's book reads well, is accurate in its intended scope and has some potential to improve Poland's image on the international stage. Good enough for me. I have approached my English publisher many times to write an updated version of this book, taking into account the exponential changes that have taken place in Poland since when the material of the book ends - 2004. Eight years ago! Someone should examine in English the ongoing profound tragedy of the Smolensk air disaster which deserves a book in itself - all Poland is there to see. A neglected duty it seems to me. As long as sales and marketing departments dominate thinking publishers have no interest in bringing this book up to date despite the fact it continues to sell steadily both in English and the excellent Polish translation. Authors cannot publish at will except on the internet but that is something different altogether! Kind regards - thanks again - stumbled over your review. Smolensk is a slippery ground for a writer to trod on. As you are probably aware, Polish (and, to a degree, international) public is deeply divided on the subject. Causing offense to some people whatever you say is a serious risk, almost a certainty. My own views are not suitable for public discussion, but not uncommon in their lack of reverence for the tragically deceased. Many books on Smolensk disaster have been written in Polish so I guess it is only a question of time until some of them are translated. I'm not sure if international audiences would be very interested, though. Thanks for taking the time to leave a comment, it is most appreciated. I'll keep an eye on your future publications.